Exploring the country can be exciting and adventurous, so why not travel it in style and comfort using LiquidSpring's CLASS suspension systems. Transporting patients during critical times with comfort goes a long way from comfort, to safety. Our suspensions deliver both. Our CLASS® suspension systems will allow transportation of bus passengers through any terrain in a luxury style and smoother ride than traditional chassis systems. Experience a smoother, luxury ride with safer handling with LiquidSpring’s™ new suspension system, called CLASS®, or Compressible Liquid Adaptive Suspension System. 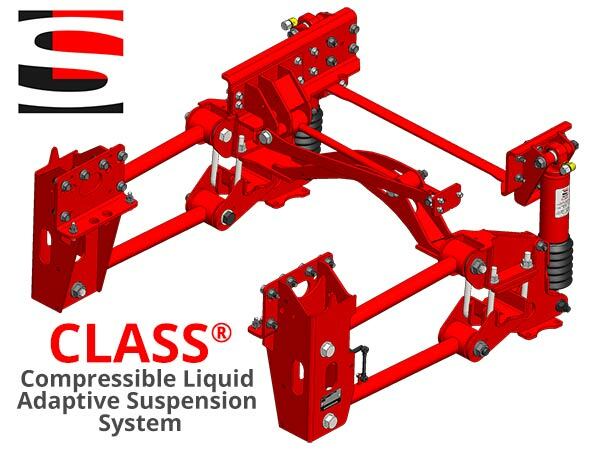 CLASS® is the next generation vehicle suspension system, utilizing a strut, with a compressible fluid as the spring/damping medium, and its sophisticated on-board microprocessor, CLASS® adapts the entire vehicle’s response to road variations and the driver. Unlike current steel and air sprung suspension systems, CLASS® is the only commercial suspension system that can automatically and instantaneously change the spring stiffness and damping at each wheel over a very broad range with minimal power consumption while the vehicle is being driven and without driver intervention. Find CLASS® for your vehicle today!